Where is the Border Between Superstition and Reality? 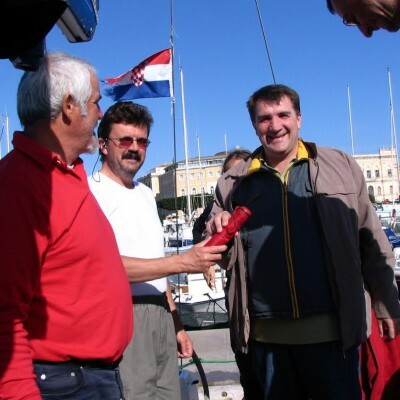 I have heard this story from a friend who joined the crew of one Croatian sailing school on their way from Central Adriatic to Malta and back. This trip has been organized for years as the completion of sailing courses within education for advanced level skipper. The boat was prepared for long-distance sailing, the crew has gathered, the provision was completed and the forecast was favorable. Everybody was excited but keen to take off as soon as possible. The chief instructor was well known Croatian skipper and a member of team that competed in Whitbread Round the World Race (Volvo Ocean Race as it is called nowadays) for two times, so everybody was confident that everything was going to be OK, even if the weather went worse. Our crew has left Jezera on Murter island in Central Adriatic in Croatia and steered their Elan 45 to SE. The administration procedure regarding leaving Croatian territorial waters was done at Ubli, island Lastovo and the yacht headed towards the Otranto gate. The mood onboard was fine and everybody enjoyed non-stop sailing, changing watches every two hours. The experienced instructor was telling stories from his journeys, mentioning few seafarers’ superstitions and interesting anecdotes linked with them. His only superstition is about the umbrella and flowers onboard. He believes that umbrella attracts rain and storms while flowers bring bad luck. So neither umbrella nor flowers are allowed onboard the yacht under his command. The crew enjoyed their cruise until they passed the Otranto and started sailing alongside Sicilian coast towards Malta. They got the gale warning and counted that there is enough time to get to Malta before the gale comes. Our crew found itself in the middle of the storm while the waves climbed up to 10 m. The storm originated above Rotterdam where the port was closed for the first time in its history, and continued its way to the Black Sea where it sank two ships. At the same time, neither ships nor planes were connecting Malta with the rest of the world. Our crew struggled the storm but was confident about the sunshine after rain. After about 36 hours of struggle they noticed a leak because the saloon was full of water. Since the engine was off, the bilge pump stopped working because the batteries could not be charged. The water had to be pumped manually so another ‘pump-watch’ was established instantly, still trying to find the source of the leak. The struggle against waves continued one more day when the storm went away and Malta appeared some 10 NM ahead the yacht. However, the instructor decided to change the course and head to Syracuse, Sicily. When they finally moored at Syracuse the crew inspected the yacht in detail and discovered that it was taking water because the bow hatch was not closed properly – some tiny rope was stuck between the deck and the window… This simple oversight made them pump some 1600 liters of water, as calculated later according to the capacity of the pump borrowed at Syracuse marina. However, one of the crew members decided to leave and catch the first plane from Sicily to Split because he had enough of sea adventures while his roommate admitted he had an extra small umbrella in his luggage. The umbrella was instantly given to the guy who had the plane to catch. There is no data about aircraft accident but sailing back to Croatia was smooth and pleasant, regardless of unfulfilled dream about sailing to Malta.